This site is dedicated to all aspects of the paranumismatics of 17th century London, particularly (but not exclusively) that series of privately issued traders’ token that circulated in and around the city during the period 1648/9 to 1672. This is a period for which we know a huge amount regarding the detail of everyday life and death in the city from Samuel Pepys’ celebrated diaries. Pepys himself had close associations with several of the people and establishments that issued these tokens and will almost certainly have regularly found them amongst the small change in his coat pockets. In the first half of the 17th century the copper coinage in England was in disarray. The King took little interest in providing small denomination coinage and farmed out contracts for minting base metal farthings to favoured courtiers such as Lords Harrington, Richmond, Lennox and Maltravers. The result of this was a poor, lightweight low denomination coinage that found no popularity amongst the public. After the civil war Parliament resumed the minting of precious metal coinage in the name of the Commonwealth. However, the resumption of striking low denomination base metal coinage was not satisfactorily addressed by the new authorities resulting in a further dearth in the circulation levels of small change. With the Royal Prerogative for minting base metal coin removed, market forces stepped in to resolve the situation with ordinary tradesmen and even some town authorities starting to issue their own low denomination token coinage (principally farthings, half pennies and pennies) to facilitate low value financial transactions. These tokens were redeemable in the shops or premisses of their respective issuers and were not widely circulated beyond the local district in which they were issued. The use of trade tokens to facilitate low value financial transactions was by no means a new concept in Britain’s economy. The use a crude cast lead and low-grade pewter tokens by many tradesmen (particularly vintners and ale houses keepers) had been ongoing in many areas of the country since medieval times and was certainly still very current in London throughout the late 16th to mid-17th centuries. A cast lead token dating to the period c.1610 to c.1650. This example depicts the initials of its issuers’ (T / H / M) on the obverse and a lion rampant on its reverse. This particular example is a “Mudlark” find from the River Thames foreshore, London. However, shortly after the execution of King Charles I in 1648/9 and the removal of the Royal Prerogative to mint base metal coinage the production of private trade tokens rapidly moved up a gear. From this date tradesmen no-longer had to rely solely on having to commission privative cast lead tokens to meet their needs. Instead professional moneyers such as David Ramage (a principal engraver at the Mint in the Tower of London) made their highly skilled services available to the market place allowing private tradesmen to place orders for the design and supply of handsome “coin like” tokens produced using professionally cut steel dies and struck using state of the art fly presses. The wide-spread use and popularity of these new die struck tokens amongst private tradesmen quickly spread to most regions of England, Wales and Ireland but largely fell short of Scotland. After a relatively short period from the time of their first introduction the handsome new style of tokens displaced the earlier use of cast lead types. The popularity and use of these new style tradesmen’s tokens continued throughout the Commonwealth period and extended into the first 10 years of the Restoration of the British monarchy under King Charles II. After reaching a peak in 1666/7 their production started to fall off with increasing rapidity. After the eventual resumption of minting of significant quantities of small denomination regal coinage the continued use and production of private tokens was finally made illegal under a Royal Proclamation of 1672. It may be assumed that their used in London (at least) did not continue long after this date. During the period 1648/9 to 1672 over 4,000 separate die struck token types were issued within the precincts of the old walled city of London. 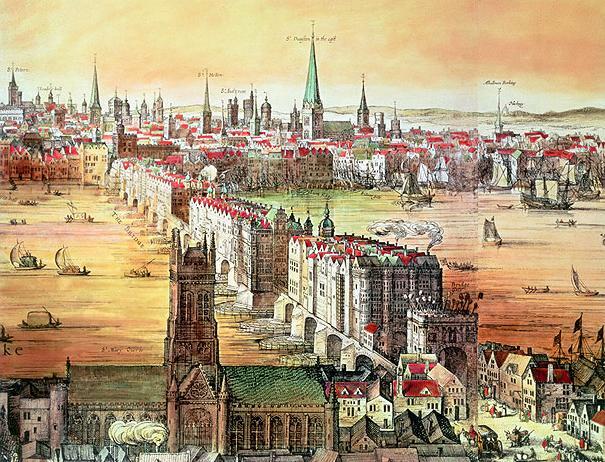 If we consider those immediate environs of the city, such as Westminster to the west, Southwark and the area along the south bank of the Thames together with the suburbs and villages to the north and east of the old city the overall number of token varieties issued during this period may well have been double that noted above. The tokens themselves were struck or pressed on blank flans made of thin sheet copper or brass. A few rare issues are also known to have been struck on tin or leather and at least one token issue appears to have been produced in cast brass. In London the issuers of these tokens span a very wide range of men and women from all conceivable trades that were represented in the city, literally everyone from bakers thought to vintners. The majority of the private tradesmen’s token were farthings measuring 14 to 16 mm in diameter and only rarely bear or mention their face value. 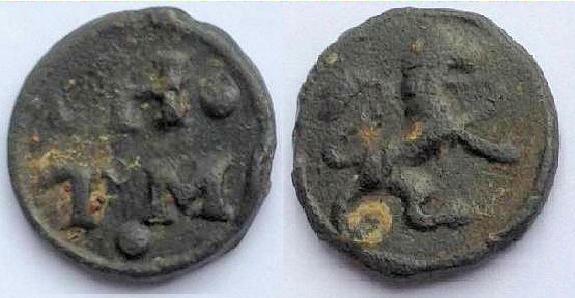 These were the earliest denomination of tokens to be produced. After 1656 half pennies began to be struck and by 1664 they represent the principal denomination tokens being produced. The half pennies did not always bear reference to their value but were normally distinguishable from farthings by their slightly larger diameter of 17 to 20 mm. After 1663 penny tokens start to appear. These often bear their value but range widely in size from 14 to 25 mm in diameter. This denomination was prolifically issued in London for use within the new Coffee Houses. There are only a very few rare issues of two penny tokens produced and these were limited to issuers living in London and Southwark. While the majority of tokens are circular in shape after 1668 a few issues were also struck on octagonal, heart-shaped and square/diamond-shaped flans. Considering the circular shaped tokens, which comprises the bulk of the series, their denominations can be closely correlated to their size but not their weight due to a wide variation in their flan thickness. Outer obverse and reverse legends: The name of the issuer and the district, street or lane on which their trade premises were located. Obverse centre field: The emblem or sign by which their issuer traded or near to which their premises were located (see note below). b) The initials of the Christian and surname name of the issuers. If the issuer was a married man the additional initial of his wife’s Christian name may also be present with all three initials being arranged in a triangular pyramid or “triad”. The issuer’s initials only appear in this location if his/her name is not contained in either the outer obverse or reverse legends as noted above. • The public beheading of Charles I in 1649 and subsequent reign of Oliver Cromwell as Lord Protector of the Commonwealth. • The introduction of the first Coffee House into London in 1652. • The end of the Commonwealth and Puritan rule in 1660 with the triumphant return of Charles II and his partying court to the Palace of Whitehall. • The catastrophic return of bubonic plague or Black Death to England’s capital city in 1665 during which 100,000 citizens were to die. • The devastating Great Fire of London of 1666 during which seven-eighths of the inhabitants of the city of London lost their homes and hundreds of historic sites including the old St. Paul’s Cathedral were to be destroyed by fire in just three-days and nights. • All of those events and colourful episodes within the city which were recorded so uniquely and with some much detail by one of the most famous diarist and fathers of the British Navy – Samuel Pepys. I hope others will enjoy reading the content of this site and will contribute their thoughts and knowledge to the ongoing appreciation of this fascinating series of British tokens.